It’s really not that difficult to build bike infrastructure so that city streets are safe and efficient for everyone. 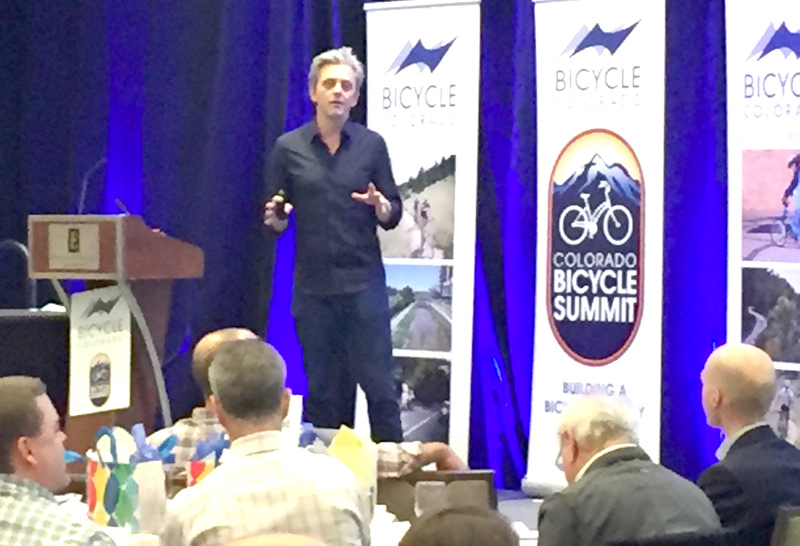 That’s what Mikael Colville-Andersen, the “bicycle urbanism” expert who founded Copenhagenize, wants Colorado to know. Colorado DOT Executive Director Shailen Bhatt, one of the proverbial Men, missed Colville-Andersen’s talk but came later. Bhatt spoke about the need for complete streets, including bike infrastructure on Denver’s deadly urban highways like Federal Boulevard. Sounds good. So what’s he gonna do about it? In practice, we have yet to see Bhatt take street space and repurpose it for bike lanes that are protected from vehicle traffic. He does seem open to building protected bike lanes on some of Colorado DOT’s urban highways, but he’s been reluctant to act first, saying he wants neighborhoods to tell him they want change. It’s always good for neighborhoods to speak up for safer streets, but at some point DOT has to take the initiative and make streets work for biking and walking. The contrast between the two speakers could not have been more stark. Mikael spoke of working with Anthropologists and responding to human behavior, feeling out what is comfortable for humans, and the availability of four basic bike infrastructure designs. Director Bhatt spoke of “engineering geniuses” and solving these complex problems that only exist because we’re still prioritizing and planning for the “need” of everyone to get around by POV with minimal delay. What our leadership needs to understand is we cannot build for people AND congestion-free motoring. It’s either/or, and as long as we continue to widen every street every time it hits LOS D, we’ll never “move toward zero” deaths nor see the true benefits of our substantial investment in transit, and less substantial investment in bicycling and walking infrastructure.